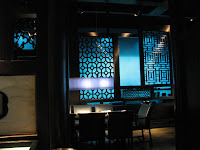 I have written earlier about the Miami Beach branch of Hakkasan, a spinoff of the London original which we visited several years ago. I noted then that it was a "serious bummer" that the lunchtime dim sum menu available in London was not being offered here in Miami. Happily, that oversight has now been remedied, and the dim sum menu is now available Saturdays and Sundays. I tried it this weekend with my usual dim sum companions, Frod Jr. and Little Miss F.
The Miami dim sum menu is, perhaps unsurprisingly, more abbreviated than the one you will find in London. While the London menu offers nearly 40 different smaller items, exclusive of roasted meats, soups, vegetables, noodle and rice dishes and more entrée-style dishes, the Miami menu offers only about half that many - more of a "best hits" compilation, with a few twists here and there. 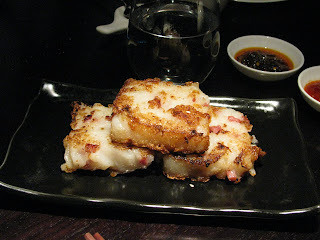 These turnip cakes were possibly the best I've ever had - wonderfully crispy on the outside, creamy and tender inside, and generously studded throughout with sweetly spiced lap cheong (Chinese sausage). Frod Jr. had a "why didn't you tell me these were so good?" moment when he tried them (he had previously scorned them, believing they were tofu). 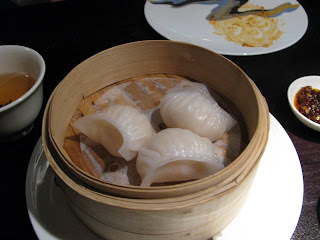 Shrimp har gow are a dim sum mainstay and often a good barometer of the quality of a restaurant. These were fresh and tasty, though I found the wrapper to be a little more elastic and firm than some of the best examples that I've sampled. 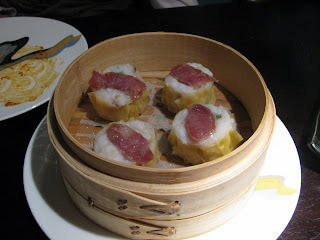 Shiu mai, typically filled with minced pork, sometimes mixed with shrimp, are another dim sum staple. Here, Hakkasan mixes things up a bit, substituting minced fish for the traditional filler, and topping them with a slice of lap cheong. 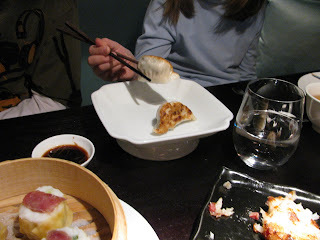 These were a surprising disappointment - they tasted fishy, and putting the slices of sausage on top meant that they never really incorporated their way into the flavors of the dumpling at all. You had to move pretty fast at our table to grab one of these "grilled Shanghai dumplings" (more often known as "potstickers"). We tried these from the dinner menu on an earlier visit and I thought then they were a great bargain (relatively speaking) at $8 for 6 pieces. The pricing of $6 for 3 pieces on the dim sum menu was less appealing (more on prices generally later). These steamed char siu bao, filled with chopped Chinese BBQ pork, had a nice fluffy, sticky dough, but I found the char siu filling overly sweet. 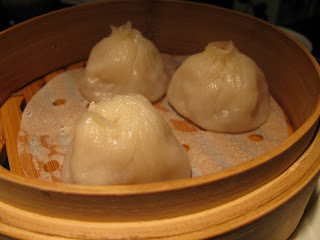 Until recently, Shanghai soup dumplings - a/k/a xiao long bao - were a mysteriously elusive item in Miami. They were briefly on the menu at Hong Kong Noodles, then gone. Mr. Chu's on South Beach used to have them, but closed. 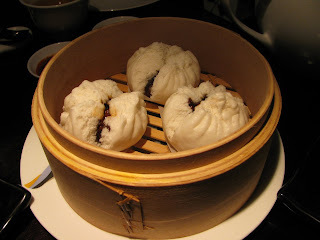 Hakkasan now has them, though I nearly didn't recognize them under the moniker "siew long bun" - I was glad I asked. These magical little creatures, whose praises I've sung before, have, in addition to ginger-inflected minced pork, hot broth encased within, which gushes out as you bite the dumpling skin. These were a very good rendition - perhaps not quite as good as those at Yank Sing, but certainly better than some we've had in other San Francisco dim sum houses. Our waiter confessed that they were still learning the dim sum menu and he didn't know what the "hamm sui gor" were - we decided to order them and find out. 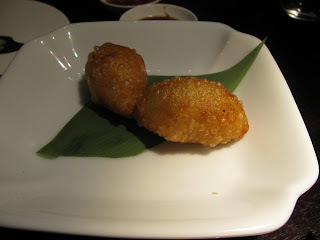 It turned out they were these fried dumplings, with a casing made from pounded glutinous rice (crispy outside, gummy inside, and a touch sweet) surrounding a sort of gooey pork and mushroom filling - all somewhat texturally and structurally reminiscent of a croquette. From a little googling it seems the customary transliteration is "ham sui gok." 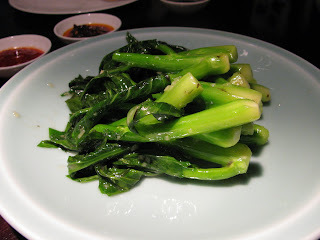 The gai lan (Chinese broccoli) can be had either with oyster sauce, garlic sauce, or ginger sauce. We went with ginger and it was one of the best renditions we've ever had. Though the typical oyster sauce can be heavy and overly salty, this was lighter and nicely complemented the stir-fried vegetable, which I enjoy for the nice combination of firm stalks and tender leaves. We added on a yang chow fried rice to round out the meal, which was pleasantly light and un-greasy, and generously studded with small shrimp, slivers of egg and bits of char siu pork. Aside from dumplings, you can also order several different roasted items (duck, chicken, pork), congee (rice porridge soup), and a few choices of noodle dishes and entrées. So was it the best dim sum I've ever had? No (though it is possible the London original might get that honor). Is it the best dim sum in Miami? Depends what you care about. Certainly, it is hands down the nicest place to have dim sum in Miami - I noted earlier how effectively they've duplicated the "high class opium den" look and feel of the London original. And some things were excellent: I loved the turnip cakes and the gai lan, and I'm thrilled to have a local source for xiao long bao again. But other items, like the shrimp har gow, were not appreciably better than what you would find at Tropical, and indeed some like the shiu mai were worse. And the prices are, well, off the charts. What you see here, plus a pot of tea, ran about $100 (including tip) - which is nearly double our usual bill at Tropical (particularly if you also add in the $10 valet, which is the discounted rate after validation from the restaurant). Prices for most dim sum items run in the range of $6-$8 per order, which usually consists of 3-4 pieces - which is probably a good 25-50% higher than what you'll find elsewhere. So this is not your typical low-budget weekend dim sum fest. But for something a bit more posh, and certainly well within the range of a typical Sunday brunch, the Hakkasan dim sum brunch is a unique alternative. Hello Frodnesor, the dim sum looks divine but the prices are outta control! What can you expect from a hotel restaurant though? Went to Hong Kong noodle, the food was good but there were no carts and you had to order from the kitchen. I miss the experience of "instant food!" I don't think the issue is that it's a hotel restaurant - the London Hakkasan, which is a stand-alone, is expensive too. As I think I've said before, pushcart and menu ordering each have their virtues. The nice thing about ordering off a menu is that everything should be made to order and be fresh and hot (something that causes occasional complaints at Tropical). F, I guess I'm just longing for the true yum cha experience which I won't be able to get here in Miami. I'll have to save it for when I go back to Sydney or NY and embrace what we do have, lots of Latin! I love your blog, it's my first visit but I'll still be back. What is the address on the Dim Sum place in Miami Beach? I'm a resident of Miami Beach and could use a new place for Dim Sum as I usually drive to west Miami for that type of food. Great blog, very descriptive and helpful. Will try Tropical's dim sum thanks to you!